Leonard Alexander Snead was born on 29 MAR 1925 in a small farming community in the hill country of Virginia. He lost his father at an early age and was raised by his mother who instilled in him, in his most formative years, a strong sense of family, duty, honor, and country. As a farm boy, from the hills of Virginia, "Zander" (his boyhood nickname) carried with him a love for people to the U.S. Naval Academy where he graduated in 1946 as a member of the excellerated Class of 1947. It was just before his academy days that he acquired, the ever lasting nickname, "Swoose", from a popular song of the same name. In his first class year, at an academy dance, he became acquainted with his bride to be, Elizabeth Sandruck of Baltimore, MD. After graduation, he received his Wings of Gold in 1950 and then spent the next six years serving in a number of JO billets. In 1956, he was selected to serve as Flag Lieutenant for the Commander Carrier Group Three which was to help shape his career. After graduating from the Naval War College, he went to Test Pilot School and stayed in the Test Center where he remained until 1963. He progressed through a number of assignments which culminated as Head of the Flying Qualities and Performance Branch. Immediately thereafter, he assumed command of ATTACK SQUADRON SEVENTY-FIVE -- the Navy's first fleet operational A-6A squadron, which embarked for Viet Nam the following year. A second tour as CO of an A-6 training squadron followed with some sea time as OPS officer aboard the USS Independence added for good measure. Quick progression followed. 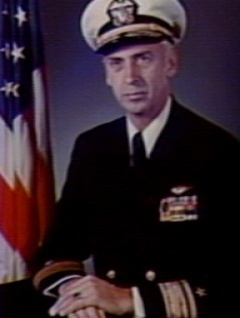 From June 1967 to August 1969 he was the A-6A AIRCRAFT PROGRAM COORDINATOR in the office of the Chief of Naval Operations. Next he was ordered to Command of the USS DIAMOND HEAD, and in November 1970 he assumed Command of the aircraft carrier USS FORRESTAL. RADM Snead was selected for Flag Rank in February 1971 -- and in July he was ordered for duty as the Program Manager of the F-14 Aircraft / Phoenix Missile / F-401 Advanced Technology Engine. In 1974 he transferred to the Navy's Master Jet Base at Miramar, Ca. to Command the FIGHTER / AIRBORNE EARLY WARNING WING PACIFIC -- which included the famous TOP GUN School -- and he retired from that assignment in 1976 with 30 years of commissioned service. Immediately thereafter, Swoose joined the Grumman Corporation -- and was assigned to the London Regional Office, encompassing all of Europe and the Middle East. In 1978, he was appointed Managing Director of all Grumman operations in Iran. After the fall of the Iranian Government, RADM Snead returned to London -- and was appointed Vice President of the Grumman Corporation, and became Director of Grummans operations throughout Europe / Middle East. After five years in London / Iran, Grumman shifted the Regional Headquarters to Paris in June 1981-- where RADM Snead and his wife lived until July 1982. At that time he left Grumman and joined Pratt & Whitney in West Palm Beach, Florida, as Manager of Navy Programs. He was appointed Vice President of Pratt & Whitney on 1 July 1983 -- and retired from P&W in 1992. Since moving to Florida in 1982, Swoose was a mainstay in the local military community, and was known as "Mr. Navy" in Southeast Florida where he could always be counted on to support such local organizations as the U.S. Navy League, The Naval Order of the U.S., TROA, and the Sea Cadets. Nationally, he is a life member of the Society of Experimental Test Pilots, The Golden Eagles, and the Association of Naval Aviation. Swoose was one of the seven members who met on 7 DEC 1999, to help start what is now known as McCampbell's Aces Squadron of the Association of Naval Aviation and has served, with his usual brand of distinction, as its first chairman. Swoose Snead leaves behind his loving wife of 57 years, Bette Sandruck Snead; his children, Leonard Alexander Snead, III; James C. Snead; Michael Snead Heisey, and William Paul Snead. Jim is a Naval Academy graduate. Both Alex and Jim are former Naval Flight Officers. Paul is in the advertising business. Michael is married to Phillip Heisey, a former Naval Aviator who now works for a defense contractor. The Heisey's son Matthew is a second year cadet at the U.S. Military Academy. As might be expected, other of grandchildren are doing equally well, and in total, the Snead's have eleven grandchildren in which they have the utmost pride. RADM Snead married the former Bette Sandruck of Baltimore, Maryland in June 1946. They have four Children and 11 Grandchildren. Commander L. A. Snead, III, U.S. Navy, a Naval Aviator and graduate of George Washington University, resides with his wife and four children at their home in Burke, Virginia. His wife Susan is also a graduate of George Washington University. CDR. Snead retired from the Navy in 1994. Commander J. C. Snead, U.S. Navy, a Naval Aviator and graduate of the U.S. Naval Academy, resides in Va. Beach, VA, with his wife Susan and two children. Susan graduated from Virginia Polytechnic Institute. CDR. Snead retired from the Navy in 1995. Michael Snead Heisey married Lieutenant Commander Philip Heisey, U.S. Navy, also a Naval Aviator, who now works with Lockheed / Martin Marietta. They reside with their three children at their home in Woodbridge, VA. She graduated from Jacksonville University, and her husband graduated from the University of Dayton and holds a Master's degree from Stanford University. William Paul Snead graduated from the Newhouse School of Public Communications at Syracuse University and is pursuing a career in Public Communications in Chicago. His wife Lisa is also a graduate of Syracuse University Newhouse School of Public Communications. Paul and Lisa and their two children live in Mt. Prospect, IL.